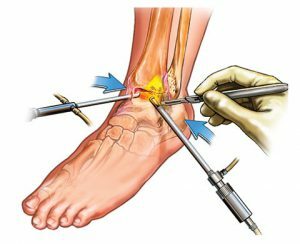 This page will provide you with information about having an ankle arthroscopy. For further details, please speak to your consultant. An arthroscopy is the medical term for keyhole surgery. This procedure enables your surgeon to see inside your ankle through a small incision using a camera. Using this method the surgeon is able to diagnose problems such as joint damage, ligament damage and arthritis. Surgery confirms what the exact problem is and in many cases the surgeon is able to treat the problem at the same time. Sometimes it is possible to diagnose problems within the ankle using an MRI scan, however you would usually need an arthroscopy to treat the problem. Various anaesthetic techniques are possible and this procedure usually takes no more than three-quarters of an hour. A camera will be inserted through small incisions around your ankle. The surgeon is then able to remove any loose material caused by wear to the joint surfaces and remove any fragments of bone or swelling from the ankle joint lining. You may require reconstructive surgery if your ankle ligaments are torn. Usually you will be discharged the same day as the procedure. The ankle may be slightly swollen for a week or two and walking may be uncomfortable. Regular, gentle exercise will aid in your recovery. However, seek advice from your GP or the healthcare team as to what exercises are best for you. The majority of people will make a good recovery and can soon return to normal everyday tasks. An arthroscopy is a less intrusive form of surgery. It allows the surgeon to diagnose and treat common ankle related problems, without the need for a large cut to skin, reducing the amount of pain you feel and ensuring a quicker recovery. Price for this procedure from £3200.